We are a diverse group of countries including developed, developing and the least developed. 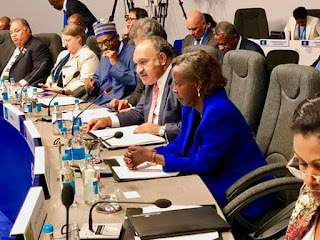 PRIME Minister Peter O’Neill has reaffirmed Papua New Guinea’s commitment to the multilateral trading system, and wants to see a more transparent, inclusive, and free and open rules-based system. In his address to the Commonwealth Heads of Government Meeting in London last week, he said that there is a need for bigger economies to help developing nations. “Trade and investment are critical to economic growth in any country. It improves in income generation and employment for our people,” O’Neill said. “However, the global economy today is threatened by the prevalence of protectionist trade measures, a surge in anti-trade rhetoric, declining investment and rising inequality. “The challenge for the Commonwealth is to rise against these trends by boosting trade and investment among our member countries. “We are a diverse group of countries including developed, developing and the least developed. “We also have many of the largest economies in the world, and several regional trade groupings including the World Trade Organisation. “This membership provides the Commonwealth with the opportunity to demonstrate leadership – to expand trade and investment and create a fairer and more equitable global economy,” he said. “Papua New Guinea reaffirms our commitment to the multilateral trading system, and we want to see a more transparent, inclusive, and free and open rules-based system. “This also requires the larger economies to help in creating more opportunities for smaller economies. “Specifically, we greater need for support to grow small and medium enterprises, and to promote the economic empowerment of women,” Mr O’Neill said.